Most of us are familiar with crows. Their unattractive calls and plumage do not make them favorites among bird watchers. However, corvids are among the most adaptable and resourceful creatures in the animal kingdom. Videos show Crows placing walnuts on roads for passing cars to crack open -- or even creating specialized tools to obtain food. Like termite-fishing chimpanzees, the New Caledonian crows use twigs to extract insects from burrows. Unlike the apes, however, the crows precisely manufacture one of several tool types -- from hooked sticks, or by stripping the edges off leaves and carefully nipping the ends into points, using the left-hand side of a leaf. The complexity of this tool manufacturing process is only matched by humans. The resulting tools are highly specific, but vary from area to area, suggesting there is a cultural influence. It might still be easy to dismiss this as instinctive behavior. 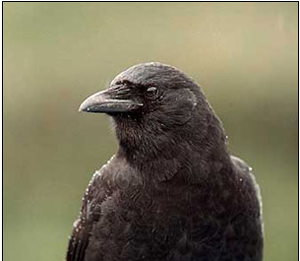 However, in 2002, UK researchers placed an untrained crow named Betty in a cage with a small bucket of food positioned at the bottom of a pipe. In repeated trials, the crow was able to take a piece of soft wire -- a completely unfamiliar material -- twist the wire into a hook with her beak, and use that hook it to extract the bucket -- an act of cunning and dexterity that rewrites the definition of bird intelligence. I used to work in the kitchen of a resort center and we threw away ridiculous amounts of food. There could be 20 to 30 crows hanging around the back of the kitchen. One time, a crow was taking beak-fulls of food at a time and flying off to nearby trees and sticking the food in holes in the trees presumably to eat it later on. Cauliflower seemed to be a favorite for this bird.